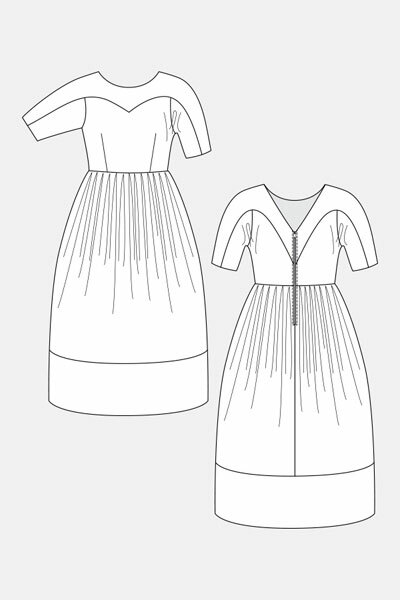 The Leotie Midi Dress pattern is a sleeved and lined cocktail dress with a heart-shaped yoke. The dress features a zipper closure in the back, semi-fitted waist with plenty of gathers, rounded shoulders and half sleeves, and a boat neck to front with V-neck to reverse. This style is provided as a digital pattern. The patterns can be printed on any standard paper sizes (such as A4 or letter) and taped together to create a complete pattern sheet. The patterns are usually divided into four files, two sizes per each file, with a separate instruction file. Patterns include all seam allowances. When you complete your order, you will be provided with a unique code to instantly download all sizes of the pattern and the instructions. See our digital product policy for full details on purchasing this digital pattern. Choose a medium weight or heavy fabric with structure, such as brocade, cloqué, dupion silk or similar. The sample is made of cloqué, with shantung silk for the yoke. Zipper 30 cm / 12"
Fabric requirements are available by clicking on the last image at the above right. All calculations include a 5% shrinkage allowance. This Named pattern comes in sizes EUR 32-46 (US 0–14/ UK 4–18). Remember that the fit of a garment also depends on the style of the garment and whether it is fitted or loose. 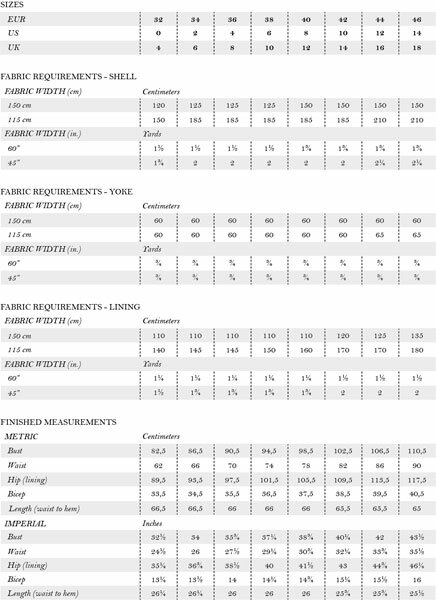 Each pattern will come with instructions that include a chart of finished garment measurements for all sizes. All Named patterns are designed for a 172 cm tall woman. You can always make your garments shorter or longer by amending the pattern. Please refer to the pattern alterations section of the Named website for further information on how to alter a Named pattern.